Today students from Preschool B and 3A (third grade) got together in the Garage to do ice experiments. 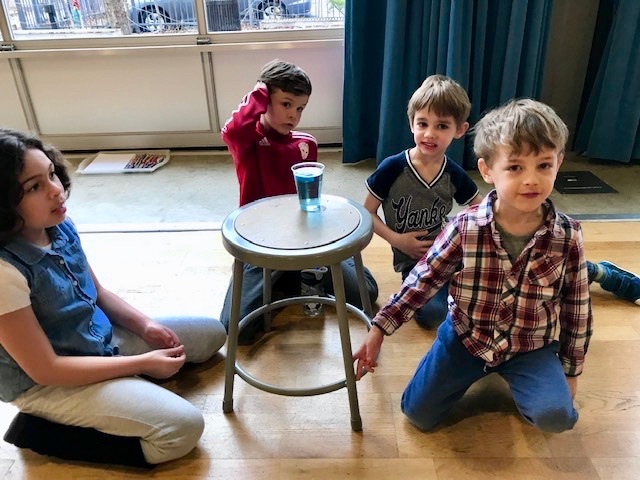 Working in groups of four, the children observed the change in a regular ice cube placed in a cup of water compared to to the change in a colored ice cube. With blue ice cubes, it was easy to see drips of blue dye as the ice slowly melted. The children recorded their observations and worked on drawings to represent the experiment. The work was fascinating, but the best part was the collaboration between the third graders and our youngest learners. Older PostSupport the 8th Grade Yearbook!